"Events of Easter Week", Fr. John Flanagan's memoirs of 1916, The Catholic Bulletin, vol.8 no.8, Aug 1918. Republished in [Jeffery, 2006]. [BMH witness statements]. Molly Reynolds statement (about 1916 Rising), dated 1949. [BMH witness statements]. Ruaidhri Henderson statement (about 1916 Rising), dated 1957. "These Priests of the Rising", Sean Dunne (Labour TD), The Sunday People, 10 Apr 1966. Republished in The Irish Catholic, 13 Apr 2006. "Very Rev. John Canon Flanagan, P.P. Fairview", by Tommy Condren. Irish Times, 28 Nov 1913, p.9. Irish Times, 25 Apr 1934, p.8. Irish Press, 17 Dec 1935, p.2. Irish Press, 19 Dec 1935, p.6. Irish Independent, 19 Dec 1935, p.5. Irish Times, 21 Dec 1935, p.4. In 1966, RTE produced "Insurrection", a TV dramatisation of the 1916 Rising. Fr. John Flanagan appears in episode 6, broadcast 15 Apr 1966. He is played by P.J. O'Donohue. John Moore, A Local History. Issue 6, Sept 1989. Issue 9, Christmas 1990. "Marino Church and Parish - 75 years on", Parish of St. Vincent de Paul Marino Monthly Newsletter, vol.10 no.4, May 1978. Fr. John Flanagan, photo 28 Oct 1920. 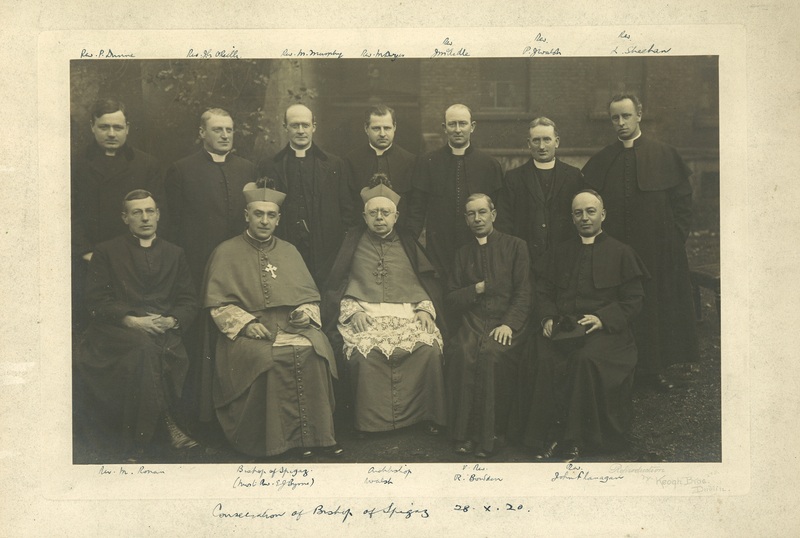 Photo courtesy of Dublin Diocesan Archives. 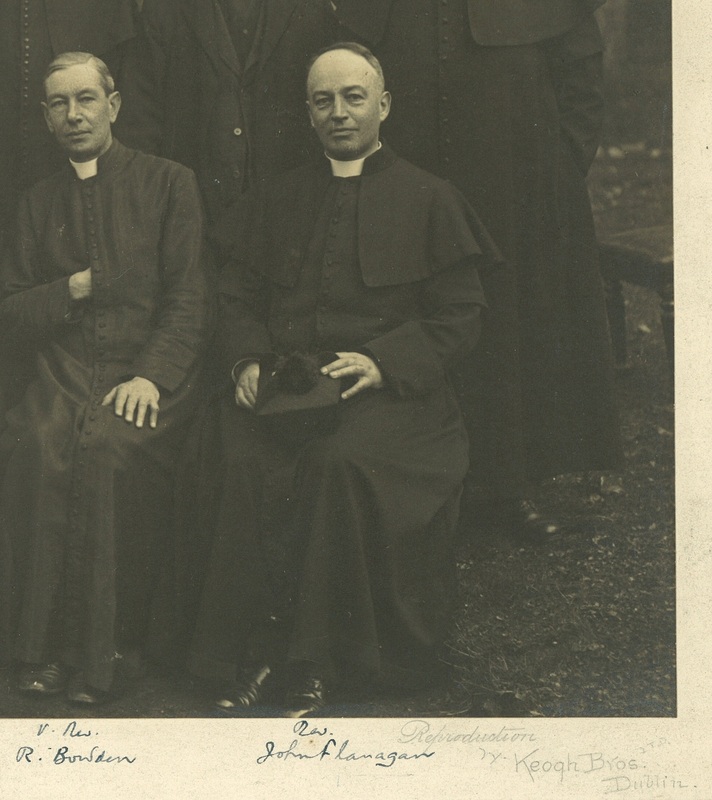 This photo was used in a 1916 exhibition at the Pro Cathedral in 2016. Jack, born 24 Feb 1872, Dublin. [Condren] says he was educ at "the University School in Sandymount" (unidentified, perhaps means C.U.S.). He was educ at boarding school in Tullow, Co.Carlow. He studied for priesthood at Clonliffe College, Dublin. Then educ at Pontifical Urban University in Rome. Listed as "B.A." in [Thom's]. Came back to Ireland c.1895. Ordained 1 Mar 1896 at Clonliffe by Archbishop Walsh. 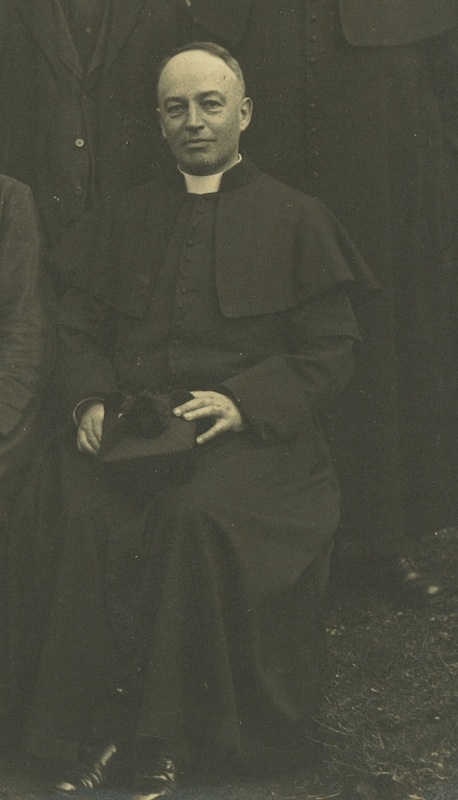 He must be John Flanagan, curate, Balrothery church, Balbriggan, Co.Dublin, listed in [Thom's] in 1897. 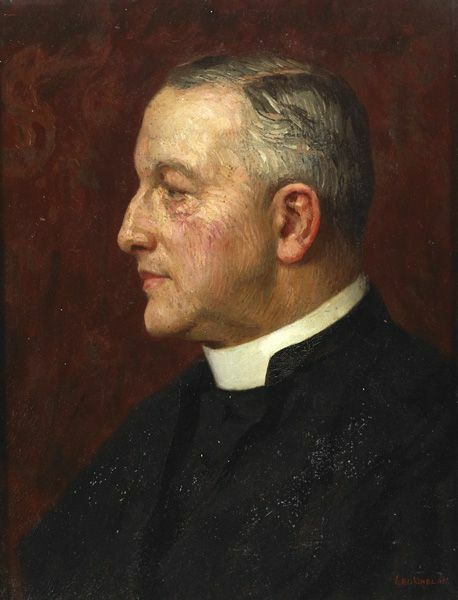 He is listed as a curate at St. Michael and John's church, Lr Exchange St, Temple Bar, Dublin, in [Thom's] from 1898 to 1901, living 7 Lr Exchange St. He is listed with other clergy at 7 Lr Exchange St in [Census, 1901]. He is listed as a curate (or C.C.) in the Pro-Cathedral, Dublin, in [Thom's] from 1902 to 1923, living in The Presbytery, 82-83 Marlborough St. He is listed with other clergy at 82 Marlborough St in [Census, 1911]. He was a witness in a court case where a man just out of prison forged a letter from Fr. John to try to get money from another clergyman. Fr. John stated he had never even met this man. See Irish Independent, Nov 27, 1912. 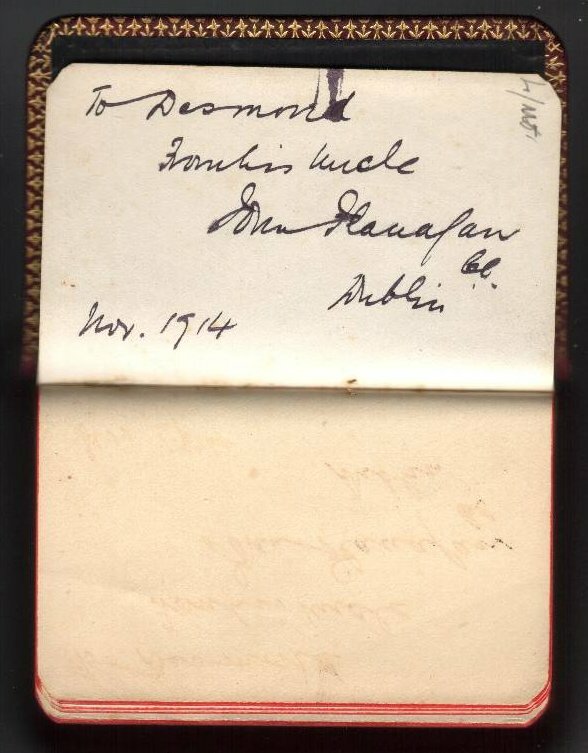 See inscription on a book, the Manual of Catholic Piety, given by him in 1914 to his young nephew Desmond Flanagan in New Zealand. The Easter Rising started on Monday 24 April 1916. The rebel HQ was at the GPO, very close to the Pro-Cathedral. Fr. John was called to the GPO by the rebels on Monday night to hear confessions. He attended wounded and dying in the GPO and in the streets nearby during the week of fighting. The Pro-Cathedral was threatened by fire. He helped pack up the parish records and other valuables. Ultimately, the fire did not reach the cathedral. He was called back to the GPO on Thursday 27 April to comfort the wounded and give last rites to the dying. He attended to the wounded James Connolly in the GPO. On evening of Friday 28 April, Fr. John blessed The O'Rahilly at the GPO before he left to meet his death. O'Rahilly said to him: "Father, we shall never meet again in this world." On Friday night he escorted women and wounded out of the GPO to hospital, in a difficult journey across streets raging with gunfire. He is listed as P.P. of the Pro-Cathedral in [Thom's] 1924 and 1925, living in The Presbytery, Marlborough St. He is listed as P.P. of Fairview, NE Dublin, in [Thom's] from 1926 on, lived the Presbytery, Fairview. He is also written as "P.P. of Marino" (before 1942, Marino was part of Fairview Parish). He built Marino church 1926-28. 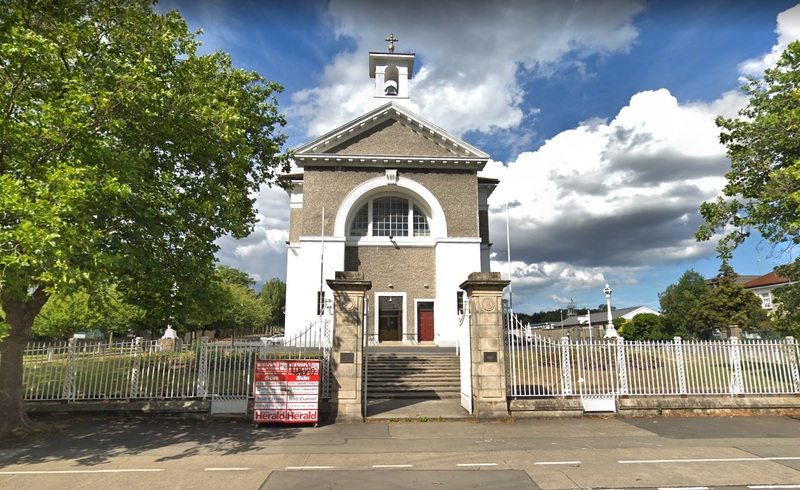 "probably the first church built after the State was set up" [Liam Cosgrave]. Foundation stone laid 2 May 1926. Apparently NOT 1928. Church finished 1928. Two schools were also built beside the church. The Solemn opening was performed on 7 Oct 1928 by Dr. Edward Byrne, Archbishop of Dublin. He became a Canon. [Condren] says in 1933. But he is listed as "Very Rev" in Alderman's will dated 1930. Not listed as such in [Thom's] 1931 or 1932 though. He celebrated the mass at the Alderman's funeral 1931. He was co-executor of the Alderman's will when it was proved in 1931 [NAI]. He celebrated the mass at P.A. O'Farrell's funeral 1933. Listed as Canon. He died 16th Dec 1935, age 63 yrs. He was bur Glasnevin Cemetery. "He died suddenly from heart trouble." [Liam Cosgrave]. His funeral was attended by large numbers including President De Valera and former President W.T. Cosgrave and Lord Mayor of Dublin Alfie Byrne and many senior politicians and veterans of 1916. Portrait of Fr. John Flanagan. Painted 1932 by Leo Whelan. For sale at Whyte's in 2013. Fr. 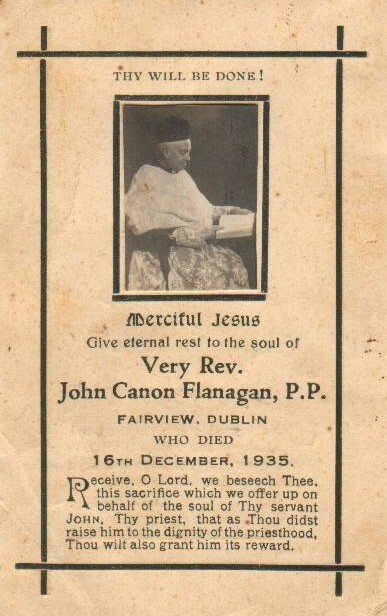 John Flanagan listed as Curate at the Pro-Cathedral in [Thom's, 1910, p.1031]. Mass card of Fr. John Flanagan. Fr. 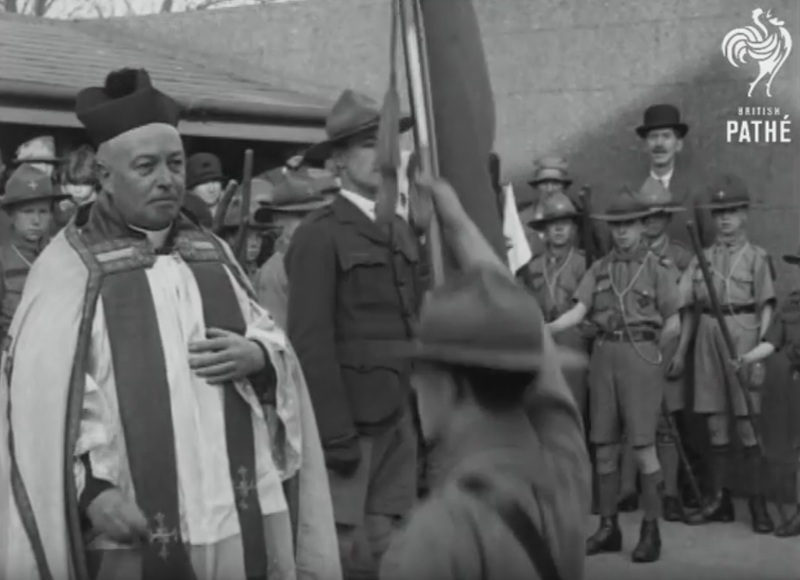 John Flanagan in 1928 with the Fairview troop of the Catholic Boy Scouts of Ireland (founded 1927). Fr. John Flanagan on the left. 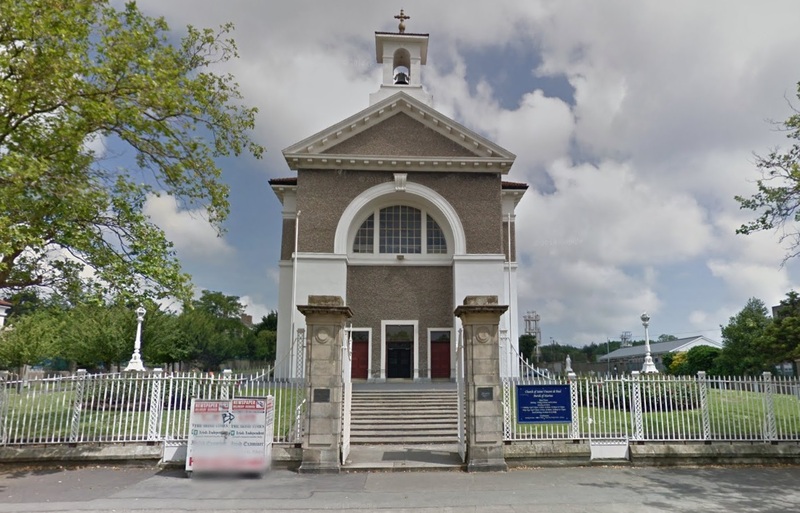 Church of St.Vincent de Paul, Marino parish, Griffith Avenue, Dublin 9. Screenshot 2018 from Google street view. 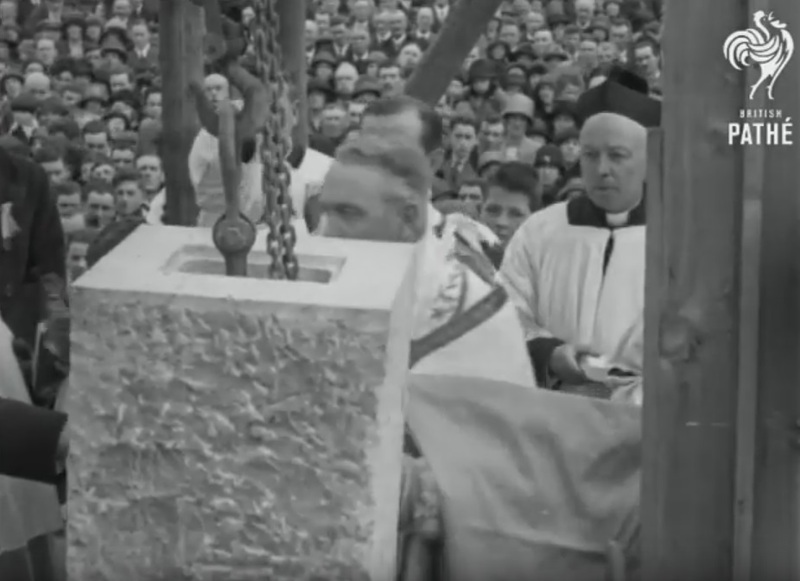 Archbishop of Dublin lays foundation stone of the new Church of Marino, 1926. This would be Fr. John Flanagan on the right. 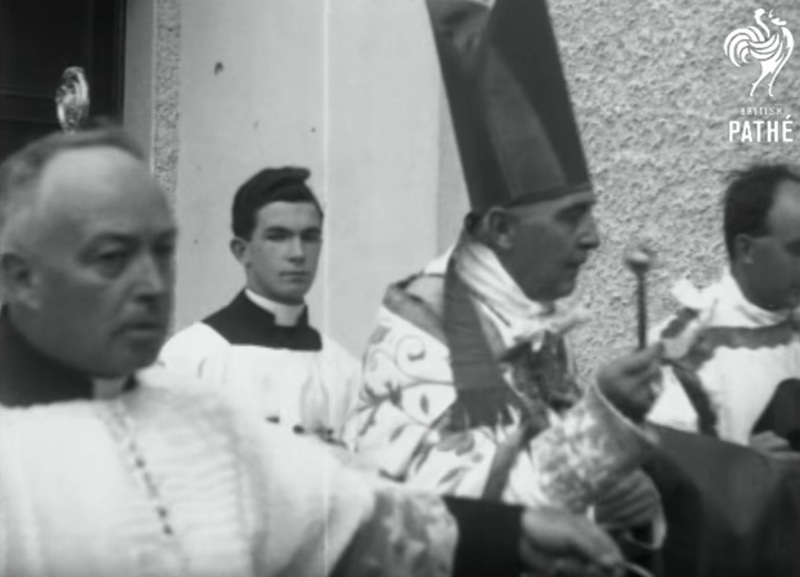 Archbishop of Dublin blesses and opens the new Church at Marino, 7 Oct 1928. This would be Fr. John Flanagan (left) assisting the Archbishop. 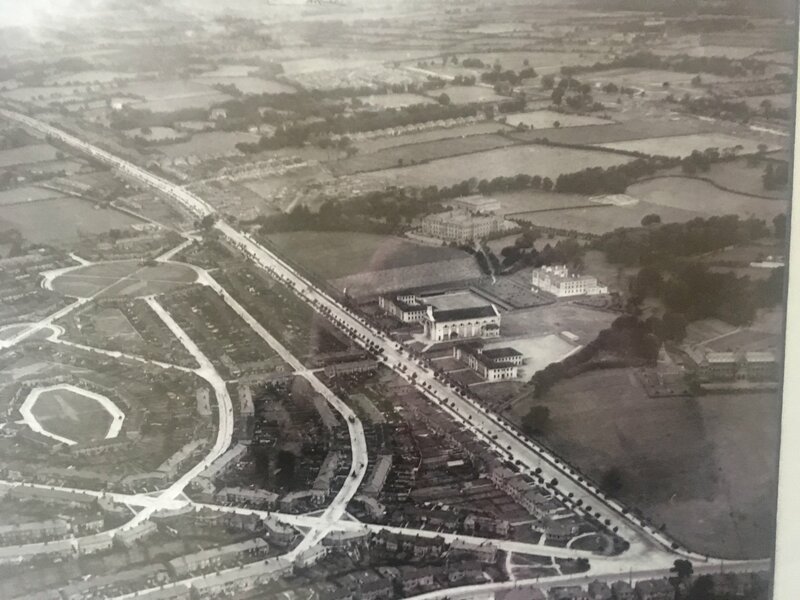 Aerial view of Marino church, maybe c.1935. 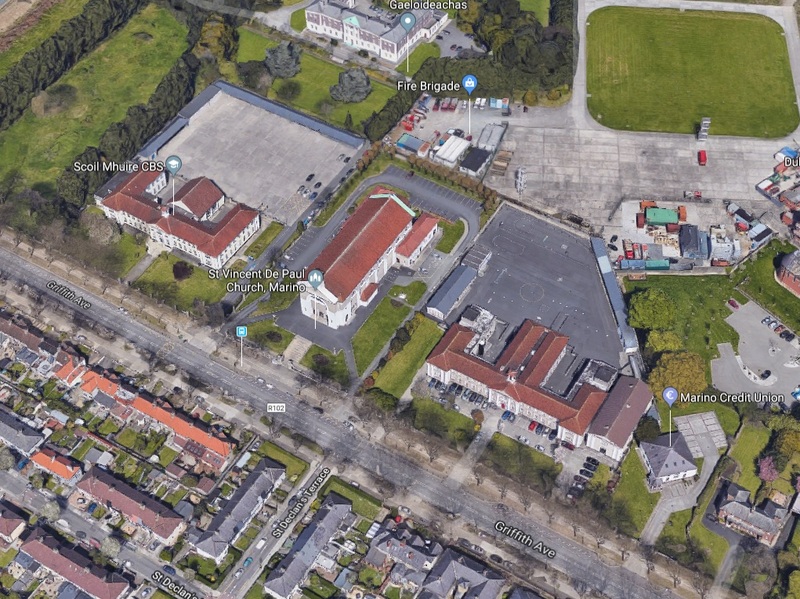 Modern 3D aerial view of Marino church. Marino was established as a Parish in its own right in 1942. Fr. John Flanagan and his brother Fr. Paddy Flanagan are no relation of the republican priest Fr. Michael O'Flanagan, of Co.Roscommon, who was one of the leaders of Sinn Fein.